Written by Liam Dickson / Photograph © Izzy Claase 2015, Feast. The Barrowland Ballroom has played host to many a band passing through on their ascent to rock royalty – Arcade Fire, Oasis, Muse, Foo Fighters, even U2 – and once again this legendary Glasgow venue will become a landmark moment in the rise of another, this time Australian outfit Tame Impala, freshly reinvented and on arguably their best form to date. As the house lights dim and the screams ring around the converted ballroom we see a solitary green light appear on the back screen presumably being controlled somewhere off stage. As thunderous bass noise bubbles up through the PA the light slowly begins to spin in a circle, turning and widening and picking up pace until a neon vortex and chest-shaking bass rumble converge in an assault on the senses. 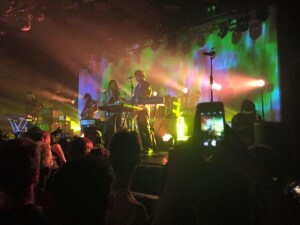 Suitably hyped, frontman Kevin Parker and his backing band (he writes and records the music himself, the name Tame Impala just a moniker for his work) emerge from the shadows to rapturous applause and warm up the crowd and themselves with a phat, trippy little jam. They don’t let the pace drop and fire straight into ‘Let It Happen’, the seven-minute opener from new album ‘Currents’ – many in the crowd are wondering how or even if the band can replicate the editing trickery used on the track to give the mid-section instrumental it’s glitchy electro quality, and they only go and nail it! Tame leant heavily on new material to fill up their set list with no complaints from the audience (their newest album is getting five star reviews left right and centre). 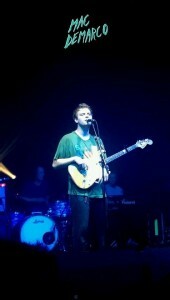 With limited space on the set list for older tracks, Parker shows a keen awareness of his own music with the choice picks he decided to include – ‘Why Won’t They Talk To Me’, ‘Apocalypse Dreams’ and ‘Mind Mischief’ go down a storm from breakthrough second album ‘Lonerism’, and now-an-oldie ‘It Is Not Meant To Be’ was a welcome surprise when nobody was really expecting to hear much from the debut. The set reached fever pitch about midway through; the foot-stomping glam monster hit ‘Elephant’ that put Parker on the musical map for many causes a near riot before seguing into new cut ‘The Less I Know The Better’, it’s almost Madonna-esque sickly sweet vocals and unbelieeevably funky guitar riff sees a thousand shoulders jostling for space as they do what main man Kevin had realised he’d never seen his fans do before – dance, unashamedly! 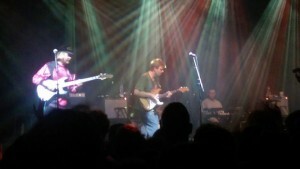 This was the thinking behind the change in direction heralded by the release of third full-length LP ‘Currents’ – as Parker improves both in musical ability and in personal confidence he sheds any anxious reservations and escapes the diminutive label of ‘stoner rock’ or ‘psychedelic revival’. Not everyone picked up on the slow decline of the previous generation of bands – the ‘noughties bands’ – that were heralded as the new guard of guitar music; acts like Franz Ferdinand, Razorlight and Kaiser Chiefs have slipped from festival headliner status to relative obscurity, while figureheads Arctic Monkeys and Kasabian have soldiered on upwards whilst morphing into exaggerated caricature versions of their former self. But the noughties are long gone now and a new wave needs to fill the void. Tame Impala are without a doubt one of the most professional sounding and well-rehearsed bands doing the rounds nowadays. Not content with merely reciting material for a paying audience, each and every song in the set was beefed up, tripped out, extended or otherwise mixed about to some degree to keep the audience on their toes (no pun intended) and to avoid performances from becoming stale – they’ll no doubt be touring this album for a long time and if there’s one thing a band hates, it’s playing the same thing over and over again. The sound, atmosphere and bright psychedelic visuals came together beautifully, swishing synths echoing round the high rounded ceiling of the Barrowlands. We saw Parker come out of his shell (or at least poke his head out) as he substitutes his guitar for adorable little dance moves on occasion and hilariously throws bottled water over the rabid crowd like a camp fountain – “I feel like I’m saving your lives or something!” Tame Impala have moved tracks and hit a musical goldmine with this new direction, and if he’s done it once he could more than easily do it again. This band will keep changing and subverting expectations and for this they will inevitably rise above the rest. All hail the next great band! Written by Liam Dickson / Photographs © Jordan Thomson, 2015, Feast. 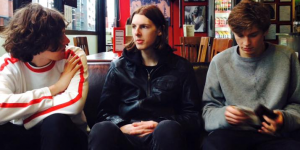 McBriare Samuel Lanyon DeMarco, or ‘Mac’ DeMarco to you or I, is experiencing a rocket in popularity – his gig at the O2 ABC in Glasgow, 7/9/2015, was a sell-out show with more fans stood outside desperately trying to blag a spare ticket. As his name spreads like wildfire through small sects of the music consuming public the adoration held for him by such listeners is only solidifying, apparent in the small army of copycats wearing full length dungarees, flannel shirts, trucker caps or all of the above (not quite a counter-fashion movement, but it’s not a stretch of the imagination). Up the stairs and through the double doors the mini-Macs wait patient but fidgety amongst a small ocean of reasonably priced merch shirts with funny biro doodles on the front and tour dates on the back, tonight’s listing mysteriously not present. The support act was… interesting! A German artist called Dinner stands solo on stage with nothing but a mic, a backing tape and some kind of rag to work with (which he drapes over his head as he violently lurches from side to side like he’s got a stomach ache). Half new romantic, half industrial techno – really – Dinner does get cheers from the audience that contradict the confused, wide-eyed faces looking around as if saying “You’re seeing this too, right? !” … a questionable choice until you consider the tongue-in-cheek, whimsical humour as synonymous with Mac as his twangy guitar picking. We saw this light heartedness first hand when Mac breaks a string one bouncer of a song into the set, before nonchalantly informing the crowd “Yeah, I need to change a string, but I’ll leave you in the capable hands of my band”, sitting cross-legged on the floor as they launched into an impromptu cover of Red Hot Chilli Peppers “Under The Bridge” – some in the crowd thought it was a muck about until the chorus came in and got a rather decent singalong. Mac DeMarco can offer to his fans what no other musician can – himself! His music and his character are one and the same, and equally loveable. Restless feet, straight-faced banter, a couple of hit-and-miss attempts at crowd surfing and screaming vocal tics genuinely had people in stitches. “Everyone give a big hand to our sound guy… you know, we only ever talk from this far away. We’ve never actually met face to face”. There is no lull in his set, every song bringing a venue wide pogo, boogie or arms round the shoulder shout-along. “Okay, let’s keep it moving. We know you like to rock, Glasgow, so that’s what we’re gonna do!” Most if not all songs from his new LP ‘Another One’ get an airing, met with as much enthusiasm as his back catalogue despite being little over a month old. The ode to his favourite brand of ciggies ‘Viceroy’ looks set to be the anthem for a new generation – “Oh baby I’ll smoke you ‘til I’m dying!” we sing, ironically, until our lungs hurt. As the set draws to a close you believe Mac is the kind of guy who wants his fans to just give each other a big hug and get along with one another – before he comes back onstage to screeching feedback then launching into a breakneck cover of Metallica’s ‘Enter Sandman’ and starting a mega-mosh – I jump in then get hit square in the eyes by a flying pint of cider. Mac’s critics may poke holes in the similarity in sound between his tunes but here he proves he can nail any style he wants when the mood takes him. Everyone in the place is left panting for breath and soaked through with sweat, the crowd and the band having given it all they could. The gig was truly unique – the intimate tunes weirdly juxtaposed with the carnage ensuing in the mid-sized venue – and considering his last visit to Glasgow occurred two years ago at Nice ’n’ Sleazy who knows where he’ll be playing in another two if he keeps his foot on the pedal. Indigo Velvet describe themselves as a Tropical Pop Quartet and definitely have a feel good vibe both in their recorded music and their live performances. The guys have been extremely busy right now with various exciting things such as bringing out a new single, playing Electric Fields Festival and an upcoming Edinburgh Headline show so it only felt right that I got in touch and seen what they had to say! –	“We have been making music together for almost two years now, and we really feel it’s starting to come together now! How did you come up with band name “Indigo Velvet”? –	“Basically, trying to think of band names is the most tedious part of starting any band. We were sitting in Lauries house (bassist) and he had a purple throw lying on this bed. It’s so happened to be velvet so we then tried out different with the word ‘velvet’ and ‘indigo’ just really seemed to stick. 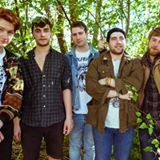 What are the bands musical influences? What processes go into the way you guys write your songs? –	“For our song writing, we’d usually go into our studio and down to basically discuss what type of song we want to go for…but 9 times out of 10 that never seems to work and we end up writing the complete opposite! Usually we structure out songs round a solid drum and bass body and then we let Darren and Jason come up with neat guitar parts. Once that is done, Darren would then hum a melody and then take that away and write the lyrics by himself. What can people expect at one of your shows? What is the funniest thing to happen at a gig? –	“Funniest thing that ever happened at a gig was when we played a festival a woman asked Jason mid-set if she could get up on stage and use a mic to try and find her friend. We were completely oblivious to what she was saying as it was all slurred..but she left before we could find her pal. –	“We have a new single out 4th of September called ‘BLUE’ and a headline show at Electric circus on the 9th of October with Lisbon and Lewis Capaldi supporting. We have a lot of stuff lined up for the start of 2015 which will hopefully get us on the write track to success. So that concludes my online interview with Indigo Velvet, but hopefully it won’t be the last time we hear from them! Below I have added ways to like/follow the band for future updates and to give them the support they deserve, thank you to Darren, Jason, Billie and Laurie for answering the questions. 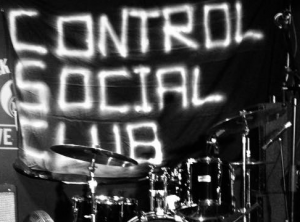 Tomorrow night (Wednesday 2nd) sees Control Social Club (cscevents) showcase a Scottish Punk / Rock n’ Roll happening featuring Glasgow’s The Rockalls, Sweaty Palms, Polarnecks and a live debut for Edinburgh’s Facial Slurs.This will be a great show, only a fiver in, and all at Sneaky Pete’s one of the best live music venues in Edinburgh for the last few years, starting at 7:00pm. Amazing!